David Hepburn Watson is a composer of music for the media and has had his compositions broadcast on BBC TV and Icelandic television. 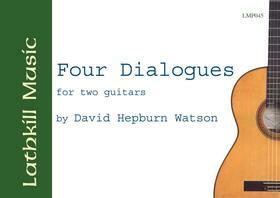 FOUR DIALOGUES is full of exciting rhythms and changes of moods and would make an excellent concert item. The work is dedicated to Phillip Thorne of the Scottish Guitar Duo who premiered the work during the Edinburgh Festival 2001. "Quite the most arresting work on the programme.....atmospheric, skilfully contrasted pieces revealed an intimate and affectionate knowledge of the guitar......very much of today but completely accessible" - NEVILLE GARDEN, music critic and broadcaster on TV and radio. "This is a beautifully crafted composition, the way the music is constructed and developed is a model for all who write for the instrument. The effect is that of a superb piece which luckily just happens to have been written for the guitar." - CLASSICAL GUITAR. "..a fascinating mixture of lyricism, rhythm,and shifting harmonies.....one of the best works for two guitars in recent years.......I do believe it will become a repertoire piece.." - PHILLIP THORNE of the Scottish Guitar Duo.